McLaren Applied Technologies is a member of the McLaren Group, located at the prestigious McLaren Technology Centre in Woking UK. Originally formed as TAG Electronic Systems, the company was created in 1989 to provide specialist electronic controls for McLaren Formula One race cars. As the usage of electronics in motorsport grew, McLaren Applied Technologies was uniquely positioned to provide leading-edge control electronics across motorsport. Today, McLaren Applied Technologies is the Official Electronic Control Unit Supplier to the FIA Formula One World Championship, the sole ECU supplier to the IZOD IndyCar® Series and from 2012 the Official ECU Supplier to NASCAR. 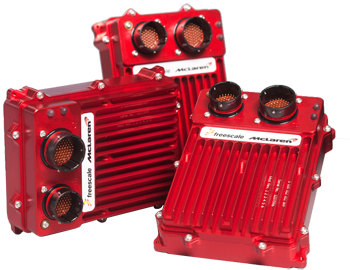 These world-class electronic control systems are capable of controlling the engine, gearbox and chassis of a modern race car, as well as providing a data logging and telemetry capability. McLaren Applied Technologies is unique in also offering a complete range of rugged, high-performance sensors to complement the broader system capability. In addition to these on-car systems, McLaren Applied Technologies provide the real-time telemetry and data analysis across all Formula One race teams. Today, McLaren Applied Technologies employs around 150 permanent people, with over 65 qualified engineers – a very high proportion of which are qualified to Masters degree or PhD level. The company’s core capabilities span Control, Monitor, Analysis and Development capabilities. All of the company’s products are developed in-house, with the rigorous motorsport environment being our incubator for new product developments. As the company continues to grow we are looking to expand our market presence from the motorsport sector into adjacent transportation and emerging markets. This includes high-end automotive, aerospace & defence, railway and machine-to-machine market sectors. McLaren Applied Technologies offers customers a complete design, development, qualification and manufacturing capability leveraging expertise that has been gained in toughest of motorsport environments. We offer our Portal to registered customers to provide a gateway to access various applications.